It took months of reminding and asking our coordinator but we finally made it to Badagry as one of our “cultural tours” of Nigeria. 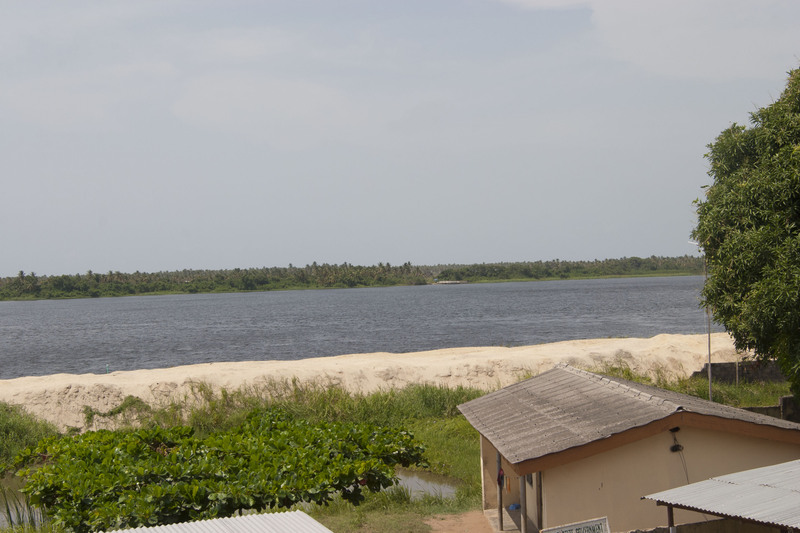 Badagry is a coastal city on the Atlantic Ocean and Gulf of Guinea, between Lagos and the Republic of Benin. On entering Nigeria by road, it is the first city you pass through. It is one of the many historical sites in Nigeria, known for being the major slave port in West Africa. Hundreds of thousands of captured Africans passed through this city on their horrific journey to be sold in America, the Caribbean, South America and Europe. The first Christian missionaries also landed here in 1842. Today, the city looks like a typical south-western Nigeria town but it is more slow paced compared to the hustle bustle of Lagos and Ibadan. It’s placement on the beach makes it ideal for tourism, so I was glad to see the early stages of construction of a massive boardwalk that would spark a tourist industry there. The most interesting part of the trip for me was touring the Heritage Museum, a museum of artifacts and information about the slave trade in Nigeria. I was moved and almost shed tears when I picked up the left cuff of a real wrought iron wrist shackle slaves were to wear on their wrists at all times. I strained to lift it with one hand. 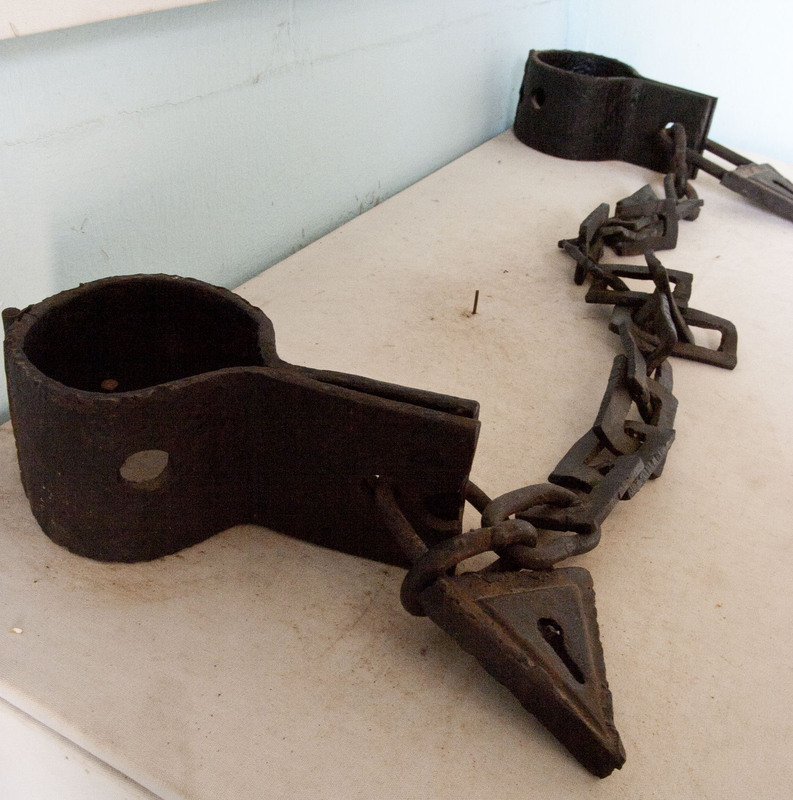 Curriculum about the Trans-Atlantic Slave Trade is mandatory in the U.S.
Wrought iron wrist shackles. I picked it up and was disgusted and appalled at how heavy it is. I have listened to many lectures, read books and seen movies about it. But all those secondary sources paled in comparison to lifting one shackle or listening to our tour guide explain in Yoruba and demonstrate how slaves were to drink out of the deep cone shaped iron drinking pot without using hands. When we finished the tour of the rooms we came out onto a balcony overlooking the Gulf of Guinea. It reminded me of finishing the tour of the Holocaust Museum in Jerusalem and coming out onto the balcony overlooking the land Jews call their own now. Our guide pointed across the water to an island covered in trees. 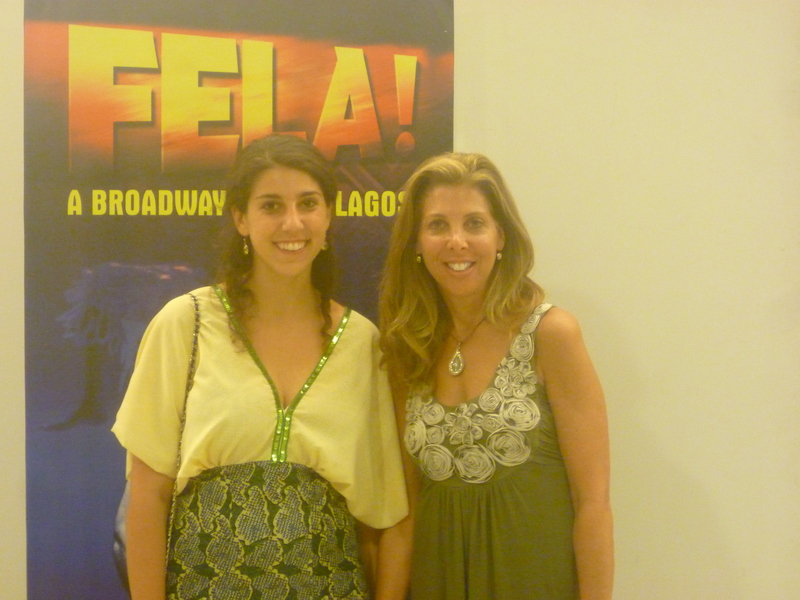 View when you finish the tour of slave history in Nigeria. The bridge across the gulf is the "point of no return." “Se e ri afara funfun yen? Do you see that white bridge? We call that place the “point of no return” because once the slaves are transported from the mainland across to that place, they are boarded into the ship and there is no way they can escape.” Thinking about the brutality that took place on the very ground I was standing on is chilling but it is a very important history to understand so it can never happen like that again. 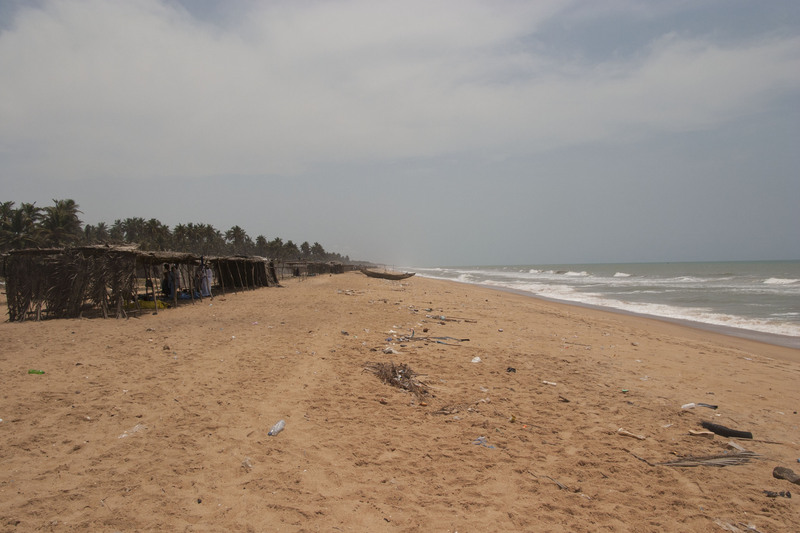 Feeling inspired, we went to the beach along the highway towards the Benin border. Except for a few souls, palm frond houses and fishing boats, the beach was desolate. The dull turquoise water receding fast down the shore crashing back with foamy tops. Our teachers would not even let us put one foot in the water because they feared the strength of the current would pull us, all experienced swimmers, out to sea. I found fun in taking pictures instead. 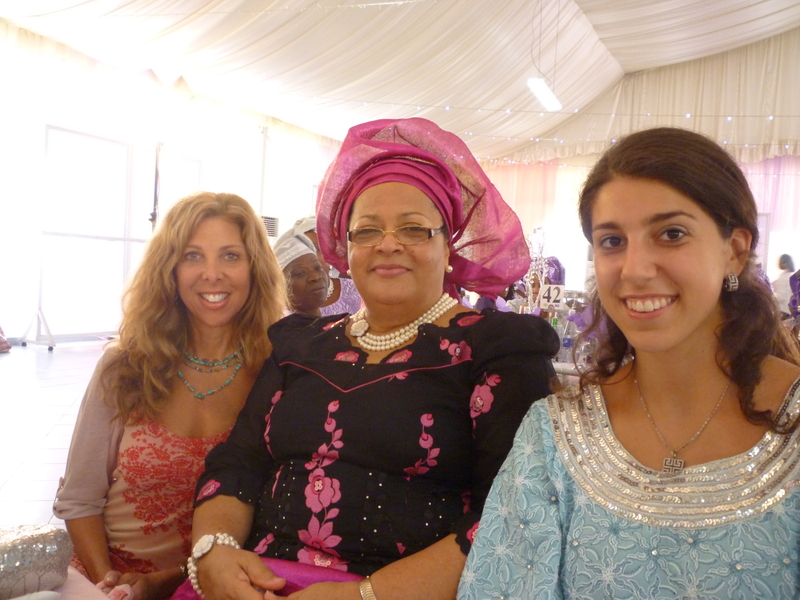 That makes the cities I’ve visted: Abeokuta, Badagry, Osogbo, Ilobu, Oke Omu, Sekonna, Ilesa, Eko, Oyo. 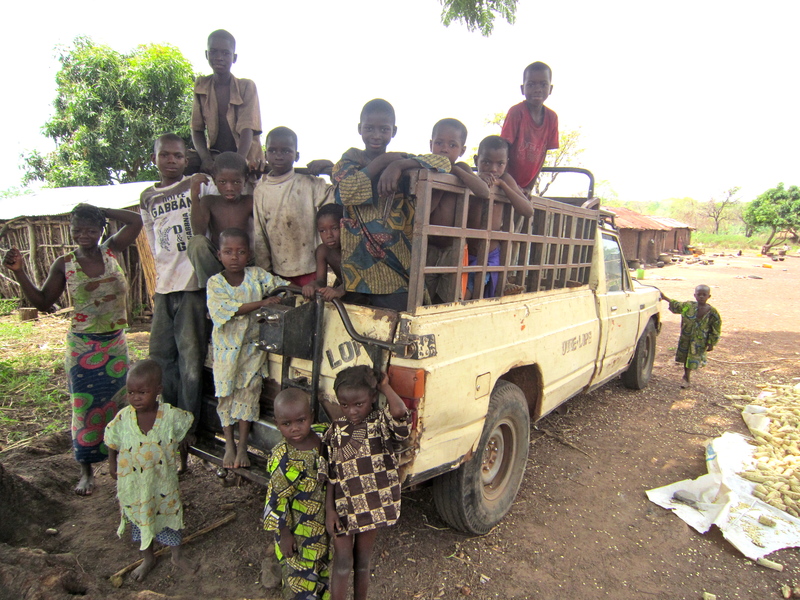 We still have to get to Ife and many others. Hopefully soon! I had the experience of visiting one of Nigeria’s national parks this weekend. In a typical Nigerian style last minute plan, my program set out on our journey to Old Oyo National Park early Friday evening, planning the trip that afternoon. 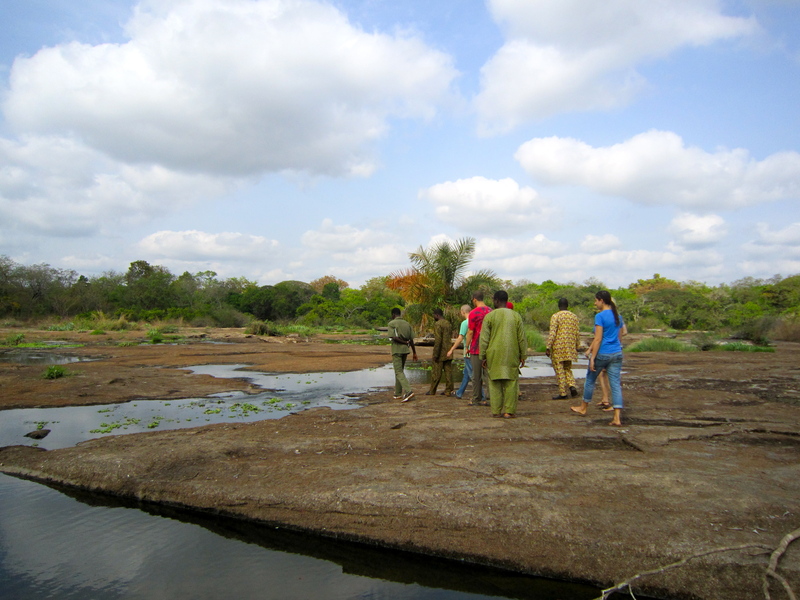 Our group walking through the dried up river basin at Old Oyo National Park. Leaving from Ibadan around 3:30 p.m., we arrived at the park’s hotel in Sepeteri around 7:30 p.m. The ride was beautiful-vast expanses of green savannah stretched out on each side of our bus. Thanks to the few recent rain falls the trees and grass are lush and full. We encountered a surprise on the way that definitely shook me up a little bit and gave me more insight into politics in Nigeria. The surprise was the aftermath of a political rally for Nigeria’s PDP (People’s Democratic Party) party–specifically it was a 50-car caravan of political campaigners to reelect Oyo State’s current governor, Alao Akala. We met the first 20 or so cars-mostly Prados, Mercedes Benz’s, Jeeps and pick-up trucks carrying Akala, his advisors and a bus of “important women” (as the sign that hung on the bus said) coming around the turn to enter Iseyin town. We stopped on the side of the road there to wait for one of our teachers to meet us and thank God we did. In the 30 minutes we were stopped, we saw the second half of the caravan pass by. Mini bus (danfo) after mini bus filled with young men wearing tattered jeans and shirts, waving machetes and guns in the air, shouting pro-PDP sayings drove by. These people are referred to as Akala’s thugs. Then came the school busses wrapped in Akala campaign slogans, a couple Coach busses adorned with Akala and Goodluck’s (President of Nigeria) faces, lines of cars wrapped with pro-Akala jargon and the man’s face. Quite a sight to see. Our teacher met us and we continued on through Iseyin. The hundreds of people standing in disarray on the street, shattered glass covering the streets, mini-busses with all the windows shattered and bullet holes in the sides told a story of what must have happened just 30 minutes before. Our bus filled with white students passed cautiously through the mess, attracting stares from the crowds. 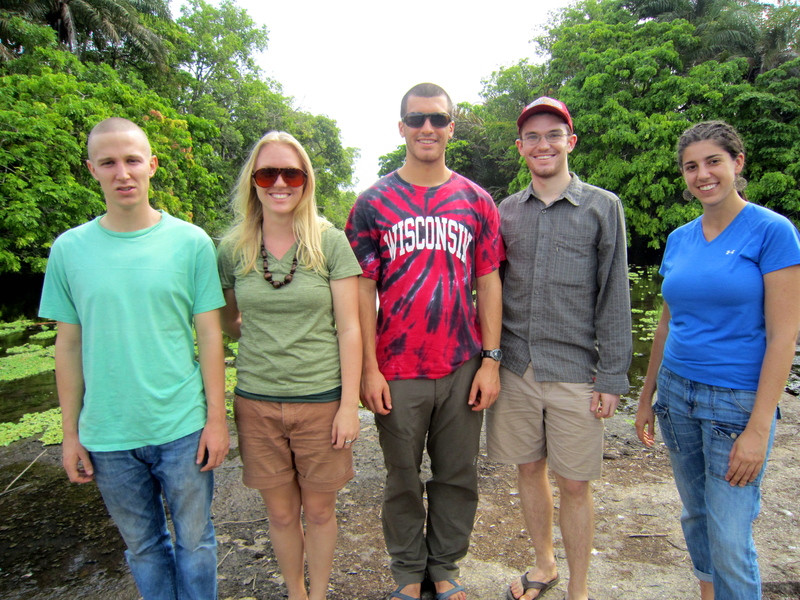 We continued on our path to the park full of wildlife and exotic plants that awaited us. Old Oyo National Park spans a shocking 960 square miles across Oyo State, Nigeria. 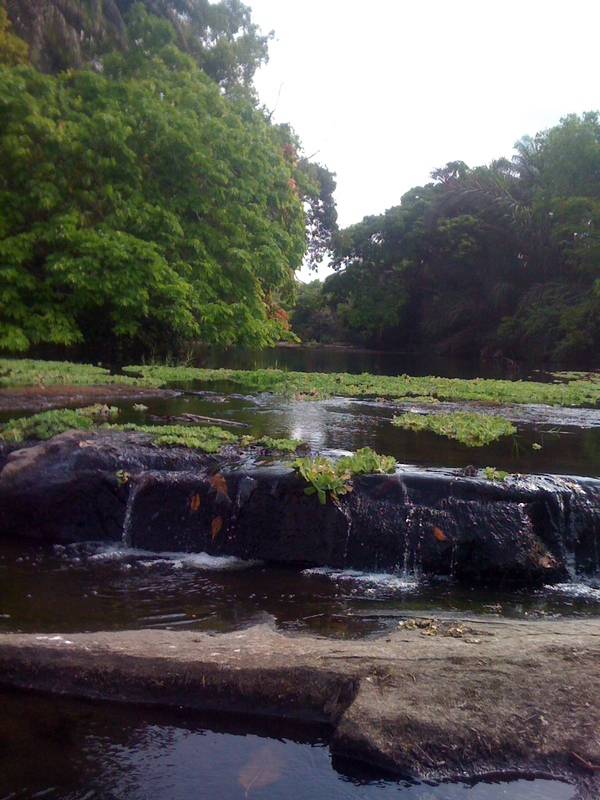 A river in the park. the unidentifiable brown mass that scurried across the road in front of our car does not count. From the comfort of our air-conditioned van we saw a minuscule fraction of the park that spans a remarkable 2,512 sq km (970 sq mi), most of which fall in Oyo State, some extends to Kwara State. The park is named after Old Oyo, the political capital of the Oyo Empire between the 16th and 18th centuries. You can actually visit the city’s ruins inside the park, but we didn’t make it that far. We saw lots of plants used for medicinal purposes (the Yoruba’s call it ago), one river, yam farms and a beautiful river basin that is dried now exposing smooth flat rocks. We toured the park for about 3 and half hours in total. For a journey that took almost four hours, including the PDP caravan sighting, it was worth it for all of the villages, yam/cassava/cashew farms and natural beauty we saw along the way. 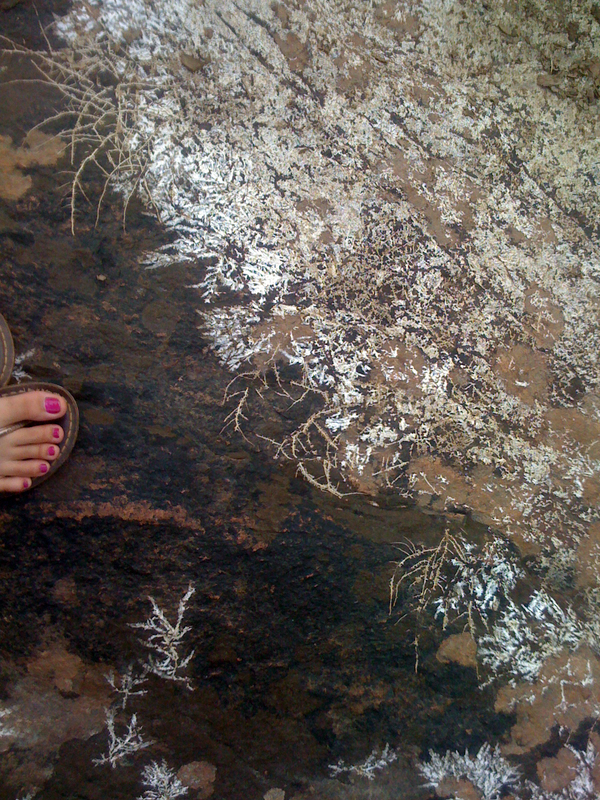 When the water dries up, it leaves little plants on the rocks which dry up in the sun and create intricate white patterns on the rocks which I thought was beautiful. 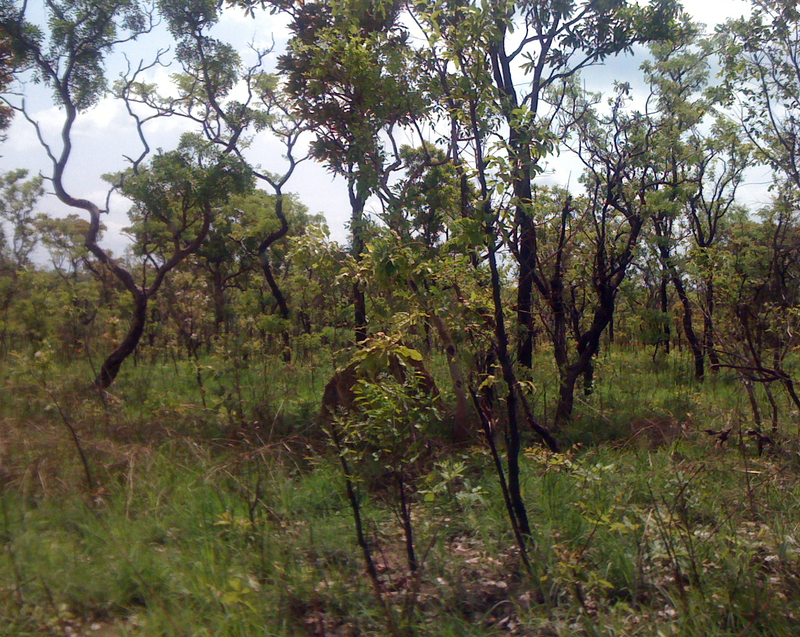 Much of the area of the park we visited looked like this, bush. They had just burned it so many of the tree bark was black but the grass was bright green. On our way out of the park we stopped in a compound on the side of the road and pounded corn for a little while. These kids were happy to see a group of Oyinbo pepe's.